Cost: as low as possible, under $6.00, preferrably under US$5.00. 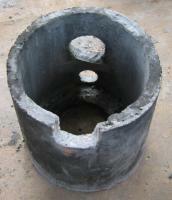 Pot size: It was expressed as a 'kilo' size meaning the pot that would N-kilos of cooked rice. The size was stated to be '4 to 7 Kg' of cooked rice. 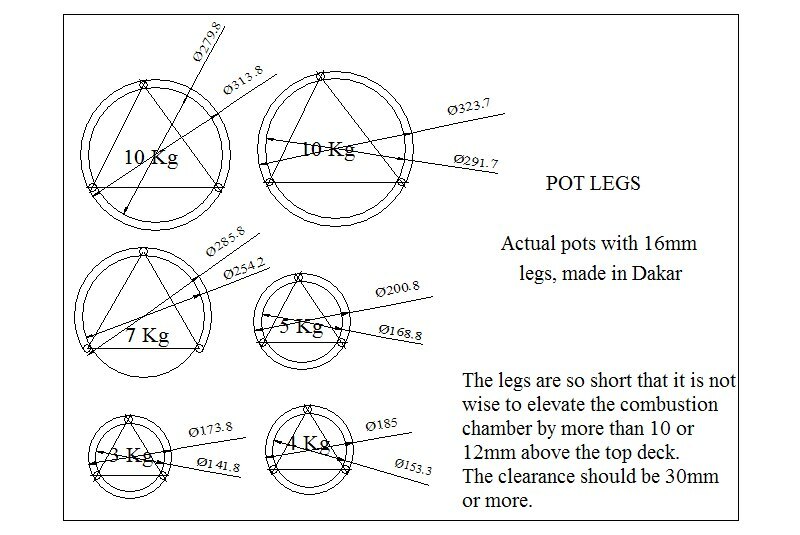 Such pots will accomodate 5 litres of water so the performance test is done using the 'normal' pots the stove is intended for but without rice in it. Description: It has a concrete body with a non-insulated ceramic combustion chamber. 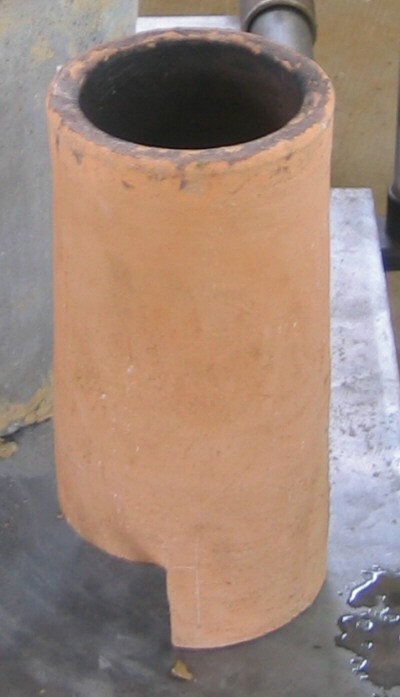 The top, bottom and outside cylinder are separate concrete parts. 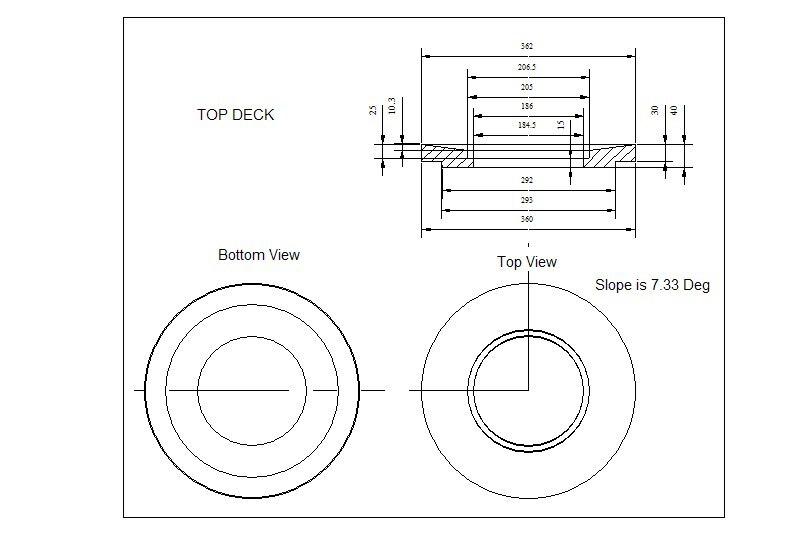 There is a metal centralizing ring that holds the top of the ceramic combustion chamber in the middle of the top deck. 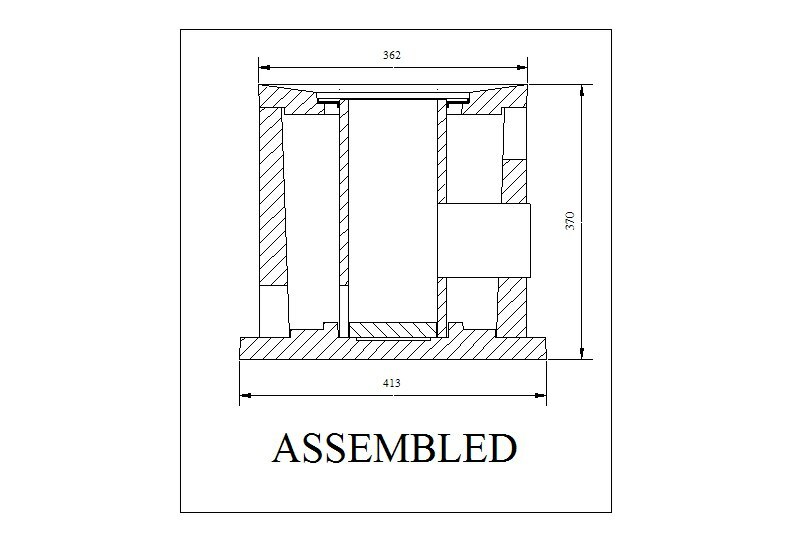 The overall dimensions are 413 mm (base diameter) and 370 mm high. 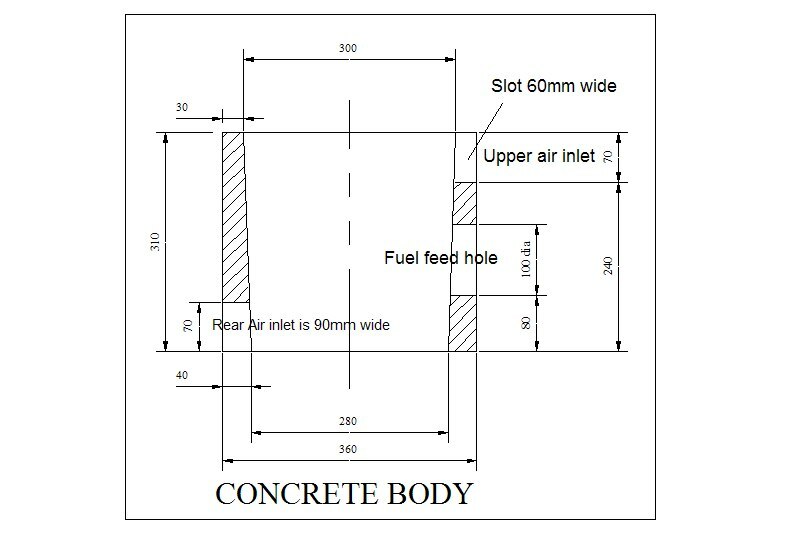 The concrete body is 360 mm O.D. 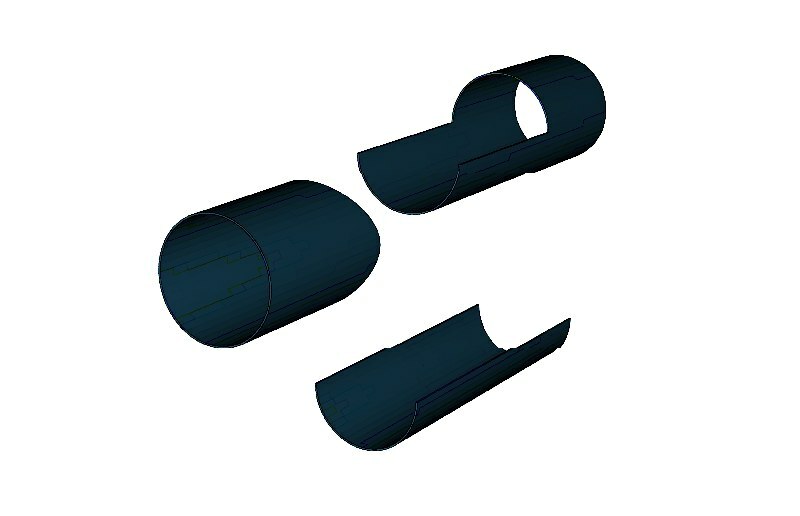 The top and bottom are separate pieces which can be modified to accomodate future design developments. 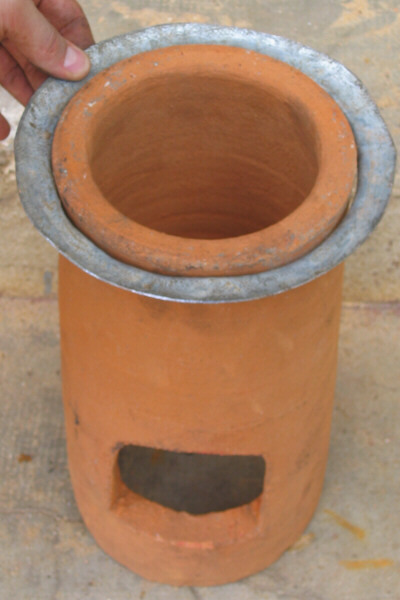 The ceramic cylinder measures 320mm high, 120 inside diameter and 144mm outside diameter. It weighs about 3.7 Kg after the holes are carved in it. It has preheated primary and secondary air. 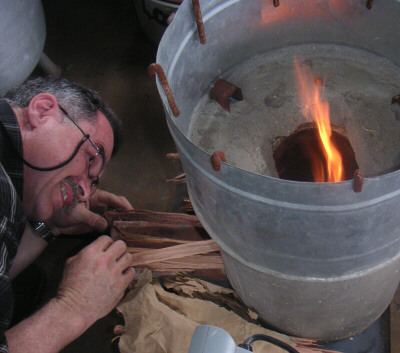 The heat is conducted through the ceramic element at a rate of approximately 400-500 watts continuous in a good fire. Combustion type: In principle, the well-known Rocket Stove-type fuel feed (side feed with no grate for the charcoal) is used. In addition it uses a contra-flowing primary air supply like the Lion Stove in which the primary air enters the combustion chamber from the 'back' of the fire and below the fuel. It also features a counter-flowing (downdrafted) preheating system. 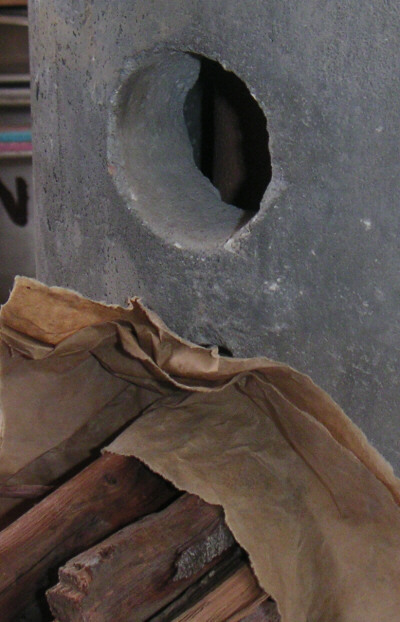 There is an air gap between the concrete body and the combustion chamber. 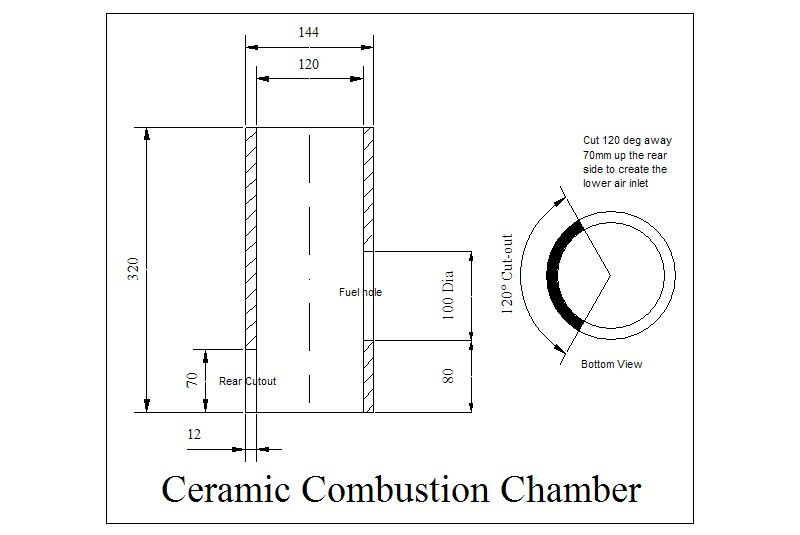 Preheated secondary air can enter the combustion chamber through the fuel feed hole in the ceramic cylinder, a hole which is not necessarily attached to the similarly-sized hole in the outer body. This type of pre-heated air supply may be novel. A metal sheet supports the fuel across the gap between the two fuel feed holes. Air entering the stove body either through a rear lower hole, or a smaller front hole above the large outer fuel hole, from where can flow to the fuel entry hole. The outer fuel entry hole is normally muffled with paper or cloth to prevent excessive amounts of air entering the combustion chamber. The development of a suitable metal closure is under way. 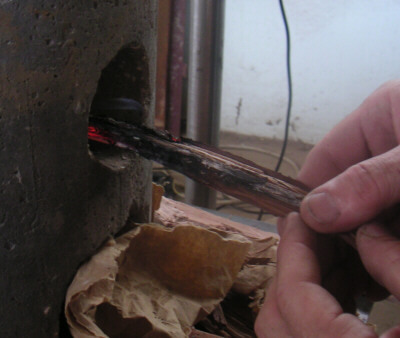 This choking has been shown to increase the gas temperature at the pot, reduce carbon monoxide emissions and increase the effectiveness of heat transfer. A ceramic pot skirt is under development. Materials: Concrete and ceramics, steel for the centralizing ring, steel for the sheet (or cylinder) supporting the fuel across the air gap. Air supply: controlled at the back by a simple plug. This is closed once the pot is boiling. Thereafter air enters the body through a round hole above the fuel feed hole. Air Control: by placing objects or cloth/paper over the holes you wish to close. Computer model: This stove has been modelled in a spreadsheet, accurately to the extent that the first tests gave exterior temperatures that agreed with the model. Beyond that, similarities may be fortuitious rather than by intent! The model predicts a temperature of 65 degrees C for the exterior surface of the concrete after the stove has cooked for several hours, in a room with an ambient temperature of 33 degrees. 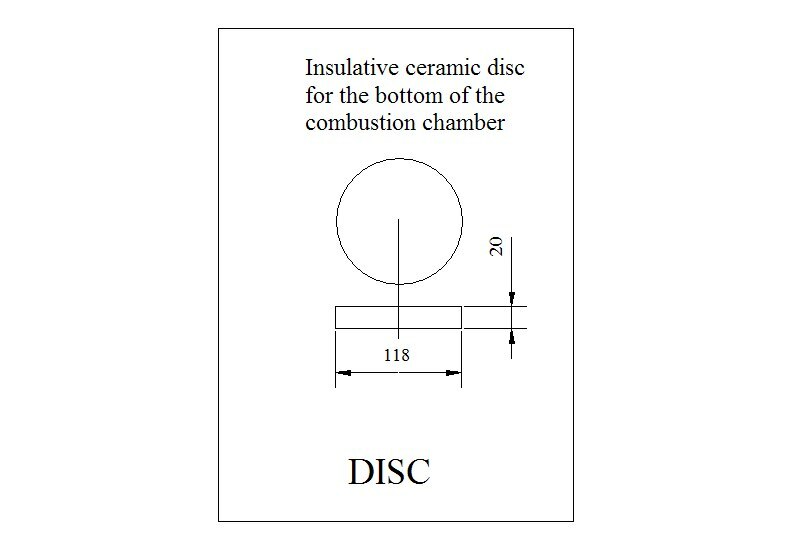 In practise the concrete reached a temperature of 66 degrees C except at the rear of the combustion chamber (a small round spot on the body) which reached 85 degrees. The lower portion of the front only reached 52 degrees. The average was about 65 C, agreeing well with the calculated heat transfer through the ceramic tube, across the internal air gap and through the concrete. Water Boiling Test: From a cold start the stove heated 5 litres of water to a boil in 40 minutes. From a hot start this reduced to 27 minutes. It is expected a third pot would heat even faster. The stove emits very little smoke. CO/CO2 ratio: It is clear from the combustion analyzer that the effect of increasing the excess air (EA) was to decrease the efficiency of combustion. The CO ppm reading remained about the same as this happened. At an EA of 350% the CO/CO2 ratio was typically 5%. When the EA increased to 800% the ratio increased to 12%, usually during a low-fire simmer. In general it showed that for a COr of under 3%, the excess air should be held below 250%. Less air meant a cleaner burn probably due to a higher combustion temperature. During simmering it was difficult to get the EA below 1000%. More air control may be necessary to achieve low CO levels when simmering. The fire was extremely small when simmering. It was found that if the main fire is extinguished, the glowing charcoal and retained heat maintained the pot temperature well, dropping only 0.1 degrees per minute for many minutes at a time. 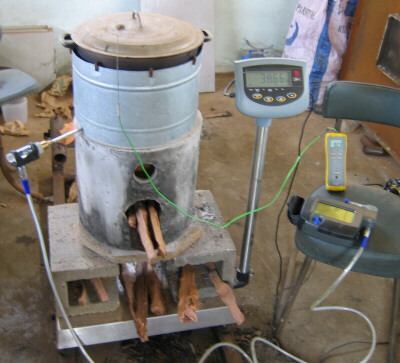 Specific Fuel Consumption: The figures for fuel consumption had to be adjusted for the large amount of water lost during the initial firing of this stove which was only 5 days old. It is recommended the stoves be aged with water for 1 month before use. 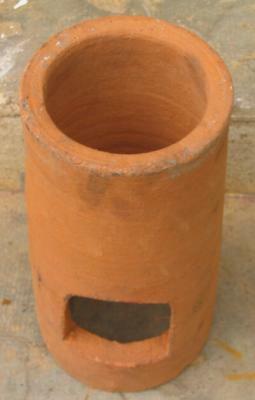 On test day, it is mostly cast concrete and quite damp, as was the ceramic cylinder which lost 300 gm of water early on. Allowing for the loss of water boiled off during the first test, (but not for the loss of flame efficiency doing so) the specific fuel consumption was 715 gm per 5 litres cooked from a cold start, and 610 gm for the hot start. The stove stores a considerable amount of heat and this assists the simmering phase greatly. The amount of fuel consumed during simmering is very small. Because the SFC number is affected by the boiling off of water during the test, the average SFC was 660 gm / 5 litres boiled and simmered for 45 minutes. Tests without the skirt have been disappointing showing that the extra draft, or at least some of it, is needed for proper functioning. 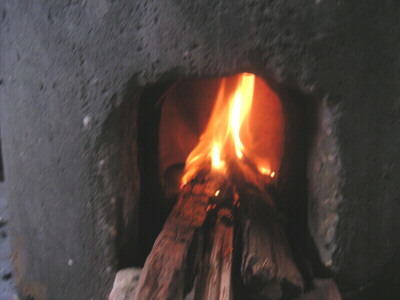 Fuel savings: It is expected that the typical open fire has a fuel consumption of 1500 gm per 5 litres boiled and simmered. The savings are +50% based on an average SFC of 660 gm for the hot and cold stove tests. Manufacture: It is intended that the ceramics be produced centrally and distributed through regular marketing channels. 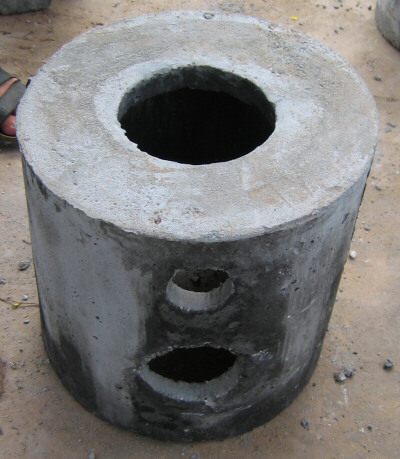 Concrete components: The concrete parts will be produced very close to the point of sale to minimize cost. The price in cement in Senegal is very low ($3/50Kg). The parts will be produced in locally manufactured steel or aluminum moulds. The concrete has a coefficient of thermal conduction of about 1.05. 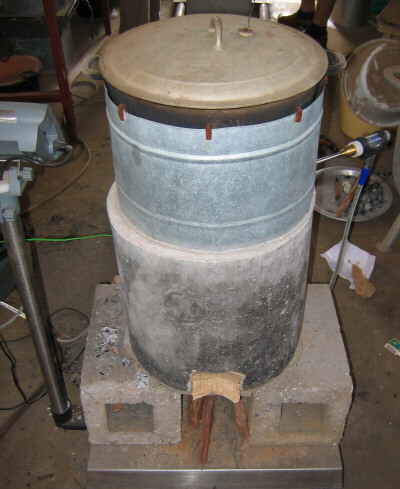 Using limestone aggregate may cause the stove to perform differently as it has a lower coefficient of heat conduction. The modelling shows safe operating temperatures for the concrete at 1.05 and higher. The stone used so far was purchased in Dakar. 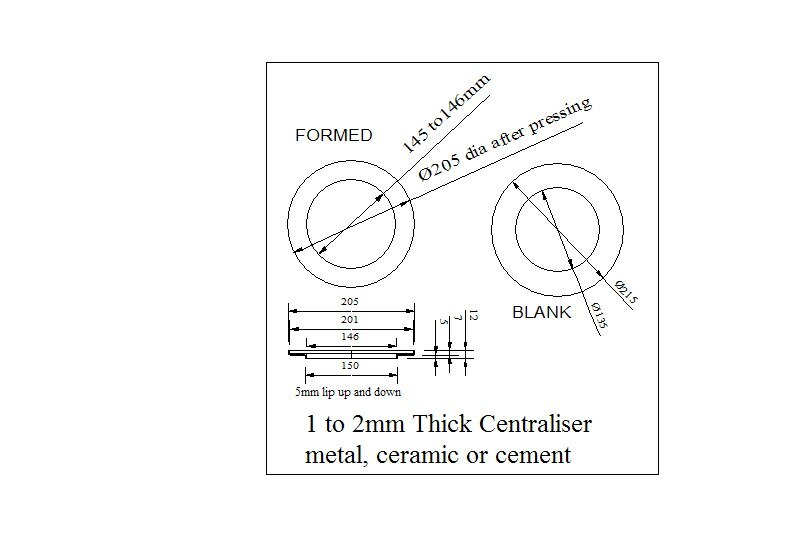 Ceramic components: A central cylinder is made on a wheel at the moment but extruding tooling is under construction. The cylinders are strong enough not to break when a fire is lit inside them. They have a coefficient of thermal conduction of about 0.72. 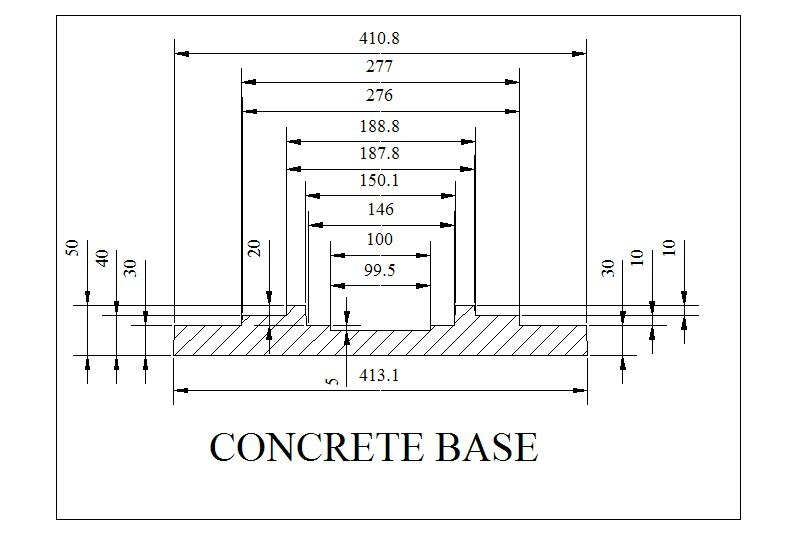 It is important that this coefficient by LOWER than that of the concrete in order for the concrete not to overheat and disintegrate. 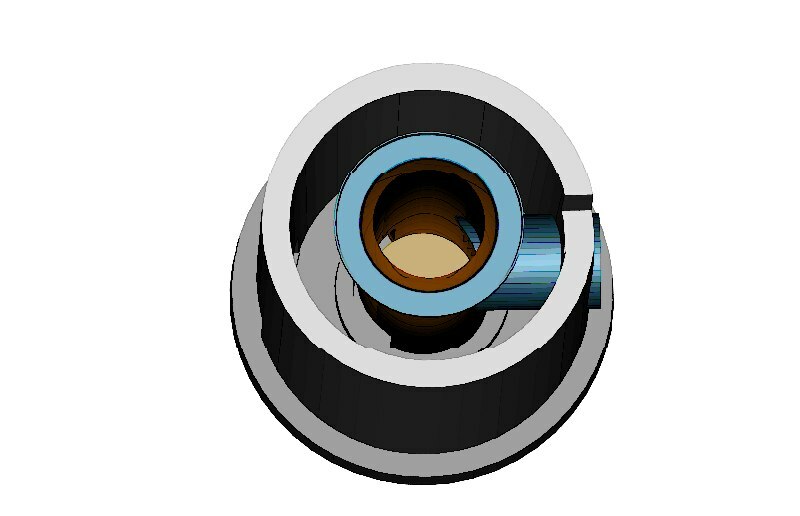 Work is starting on lowering the coefficient of thermal expansion of the cylinder, presently at about 7.8 x 10^-6/Deg C. Lowering it will extend the life of the components by increasing heat shock resistance. It is expected the rate can be reduced to <2.0*10^-6. 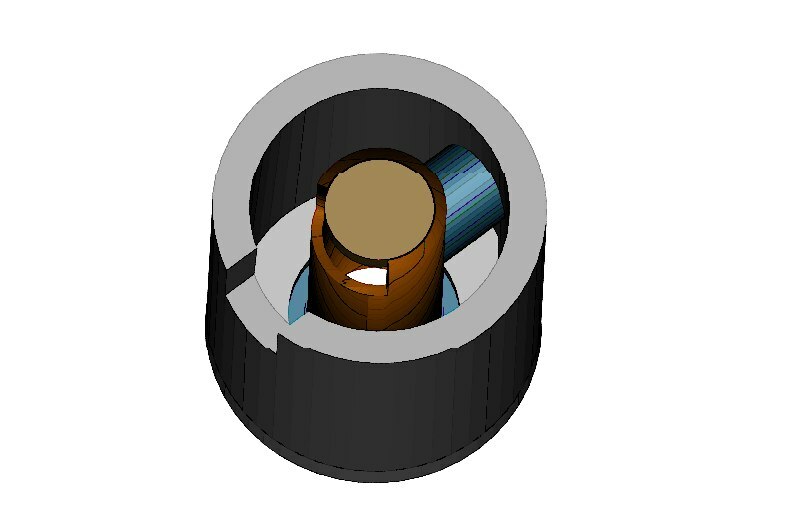 There is to be an insulative ceramic 'puck' at the bottom of the combustion chamber. In the tests so far this part was not in place. The concrete reached a temperature of 150 C in the middle of the base. The base did not crack. Note: This story can be downloaded as a 1.29 MB pdf file. See Attachments.